“People in states across the Midwest and Northeast are especially at risk, because many people might not have air conditioning, but even in the South, where we’re accustomed to heat and humidity, heat stroke and heat-related illness is a very real threat,” says UAB Chair of Emergency Medicine Janyce Sanford, M.D. Sanford says heat-related illnesses cover a spectrum of mild to severe illnesses. 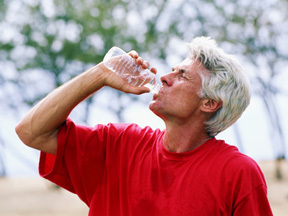 “Someone who has been working out in the heat may start to experience the beginning stages with heat cramps. As it progresses, the next step is heat exhaustion. They may develop a severe headache, nausea, vomiting, and a feeling of severe weakness,” she explains. The most serious and potentially fatal heat-related illness is heat stroke. “When you reach this point, the severely elevated body temperature causes an altered mental state, dizziness and ultimately can lead to a loss of consciousness. The muscles can start to break down, which leads to kidney failure; this makes heat stroke a life-threatening illness,” she says. But, Sanford notes, heat stroke is rare, most often seen in very young and elderly people, or those suffering from chronic illnesses. Avoid being outside during the hottest part of the day, 11 a.m. to 4 p.m., to reduce the chance of heat stroke. Wear light-colored and lightweight clothing, wear a hat, and remember that 100 percent cotton clothing tends to hold sweat, making it harder for your body to cool down. Thirst is not always a good indicator of hydration status. In children, the thirst mechanism is not fully developed, and in seniors, the sense of thirst has diminished. By the time your brain signals thirst, you may have lost 1 percent of your body weight – about three cups of sweat for a 150 lb. person. A 2 percent loss may reduce your work capacity by 10 to 15 percent. Sweating is the body’s way to maintain normal temperature. Sweat cools the skin as it evaporates, thus cooling the blood which cools the inner body. You need plenty of fluids to produce perspiration. During hot weather, body temperature will rise more rapidly, making fluid intake particularly important. Fluids transport glucose, which the body uses as fuel, to working muscles, and fluids transport away waste products. Urine color is an important indicator of hydration. A well-hydrated person’s urine will be almost clear. Darker colors indicate less hydration. Not having to urinate at all after extended intense workouts is a warning sign of real dehydration. If you exercise for less than 90 minutes at a time, cool water (40° F) is all you need to replace fluids. You should drink about 16 oz. two hours prior to exercising, eight oz. every 15 to 20 minutes during exercise, and then at least another 16 oz. after finishing. Drink until your thirst is quenched, and then drink even more to fully rehydrate. Sports beverages are appropriate if you are exercising for longer than 90 minutes. These beverages should be consumed only during exercise and not prior as they might induce a hypoglycemic – or low glucose – effect, and this may reduce performance. Overall daily fluid intake is also important, not just during exercise or periods of high activity. Sparkling water, non-caffeinated drinks, low-fat milk and fruits and vegetables all contribute to daily fluid needs, as well as water.